Book 3 in Trilogy with The Outrageous Oriel and Loyal and The Dragon (all stand-alone stories). 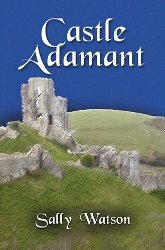 Oriel’s brother Peregrine is brilliant, intellectual, unchallenged and at Corfe Castle, Dorset, helping Lady Bankes, her children, and five men-at-arms defend it. Enter Verity, a fierce, confrontational Puritan maiden who can not only match Peregrine at literary quotes but leave him gaping with Bible ones. He finds himself challenged at last. By Verity and by a Roundhead army.